A few weeks ago I mentioned that I recently took a floristry course and hinted that there was a reason for doing it. I can now reveal that the reason is that I'm creating a Flower Farm! I've been given the opportunity to do something different and this is what I really, really want to do. It combines several of my interests and passions and I have the space to do it right here. I'm starting small this year as a bit of trial but hope to be digging up more grass next year. I'm hoping to build up a customer base of florists and flower lovers as well as selling bouquets direct. I've been working on my website www.floralacre.co.uk and have had to embrace social media. I've always kept away from them, and I was right they do take up a lot of time. You'll fine me in Facebook and Instagram. If anyone knows CSS code please let me know as I need a little help with a small change. 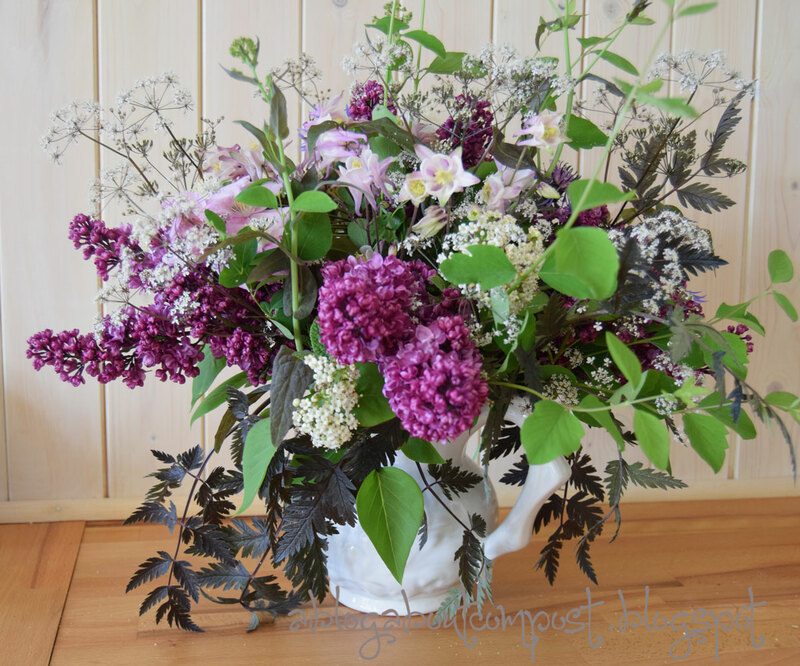 I've collecting photographs of my own flowers and I made this bouquet with the lilac which has just come out. Thank you all for your comments and encouragement on my efforts on Mondays. It's much appreciated and I've learnt plenty. I'm hoping to go on blogging but am currently finding there are not enough hours in the day. This spring has been particularly hectic for various reasons but I am hopeful that next month will be easier. IAVOM has been one of many contributing factors in this decision. Thanks as usual to Cathy for hosting In a Vase on Monday and inspiring us to be creative. Alison, this is exciting news. I wish you great success. 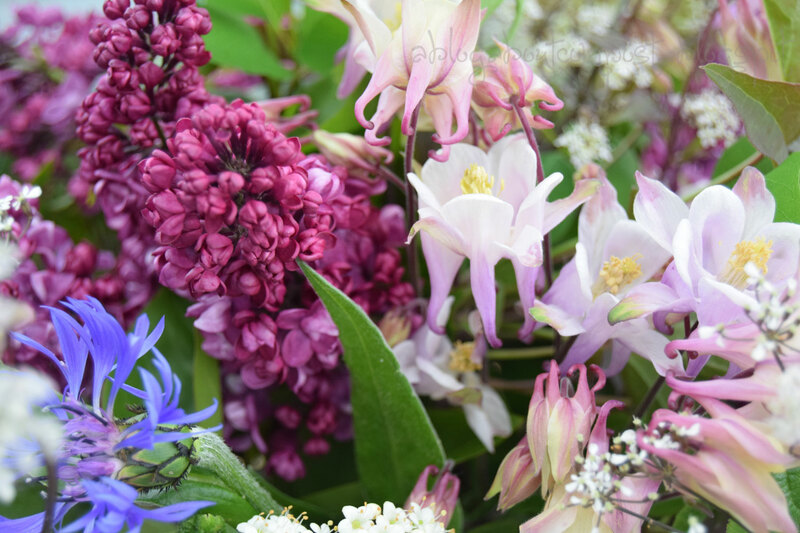 The lilac bouquet has a lyrical, romantic feel--lovely. Thank you. I love lilac and the scent wafts about. Thank you. I can recommend a course but there are many shorter (and cheaper) ones. It was good fun and very inspiring. I hope to be posting often and also joining in with #IAVOM with my shiny new Instagram account. That is a great journey! We’re on our second year of flower trials trying to see what works in our area of the Midwest. It is rewarding, frustrating, amazing, heartbreaking but if so fulfilling. So excited for you! I like the sound of most of that! There will be lots of trialling here too but there seems to be plenty of advice about. Alison I am so excited for you, and will be following along on social media. And your vase shows you have such an artistic flair. You can't help but have many customers. I only wish I lived there so I could be one!! What exciting news. I'm so happy for you that you'll be doing something that you love. You obviously have a great deal of skill in this area. Wishing you a smashing success with your new venture! Thank you. I hope it will be fun as well as all the hard work. This is wonderful, Alison! What fun you're going to have once you have all the pieces in place. You've always shown a great eye for color and arrangement in my view and I've no doubt your new business will be a success. This week's vase is a great advertisement too. I wish I'd had more success with 'Ravenswing' - it makes a beautiful accent. The funny thing is that this Ravenswing is growing bang in the middle of my poly tunnel centre bed. I should have moved it in the autumn and now it is huge and I had to let it flower. It's right where I am about the plant tomatoes but they are having to wait. It's all very silly. Lovely Lilacs and best of luck in your new venture. Oh that is wonderful. Lilac is at its finest now isn't it? I picked some too. I especially love the effect of the black cow parsley in the arrangement. Best wishes on your Flower Farm. You have the skills, determination, follow your dreams....sorry, not a dream anymore!!! Just think of all the pleasure your flowers and arrangements will give.